An Aspen tree is truly something to behold. The sight and sound of the Aspen leaf quaking in the wind is truly remarkable. 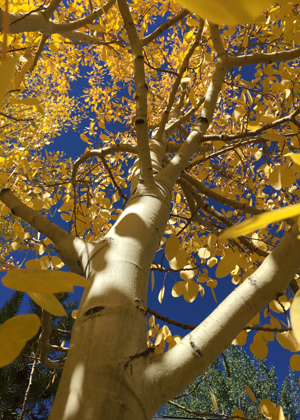 In the fall, the delicate green leaves transform themselves into that incredible yellow gold that Aspens are so famous for. Initially I was attracted to the Aspen for its beauty. Today I embrace the Aspen and proudly use it as my logo because I believe it to be an amazingly sustainable organism that is quick to adapt to its environment. The biology of an Aspen is quite unique. An Aspen forest does not actually consist of unique trees, but of a single organism with a shared root system and gene pattern. The trees that share this root system will change color at the same time as a single group. The extensive root system can spread for miles and helps a colony survive by sharing water and nutrient supplies across the colony. The largest Aspen Tree organism is found south of Salt Lake City in Utah and stretches 106 acres. Technically considered one single tree, the stand is thought to have 47,000 genetically identical stems. The unique bark of the Aspen is very susceptible to forest fires. As such, a single fire can quickly destroy a large stand of trees. Though dead above ground, the underground root system of this resilient organism will send out new stems to create a new stand of trees. Aspens grow well in unstable environments but cannot survive in the shade. When you look across a mountainous horizon you often see large swaths of Aspens amongst the pine trees. This is because the Aspen is quick to spread into sun-drenched areas where pine trees have been destroyed by fire, mudslide or avalanche. Years and years of drought have weakened trees all over the Rocky Mountain West. This draught combined with warmer temperatures and fewer deep-freezes has resulted in a flourishing pine bark beetle population. Damage from this beetle can be seen throughout the mountains and foothills of Colorado and across the Rockies reaching well up into Canada. The dead trees are a strange sight with their surreal reddish orange needles. It’s off putting and confusing. I’ve actually overheard people discussing how strange it was to see pine trees change color in the fall. No, I said. They’re just dying. Sadly, these weakened and/or dead pine trees will be more susceptible to fire, mudslides and avalanches making our forests less safe. 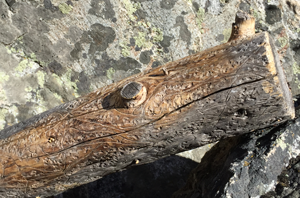 According to a 2015 survey by the U.S. Forest Service and the Colorado State Forest Service, mountain pine beetle activity is back to normal levels. This is great news, but unfortunately the spruce beetle is spreading so our forests are still not in the clear. As an avid hiker, skier, as well as rock and ice climber, I find great peace spending time in the Colorado mountains I call home. The damage to our forests is saddening. My hope is that the Aspen will reclaim the areas ravaged by the pine and spruce bark beetles. It would be wonderful to see these devastated areas naturally repopulated by Aspens whose leaves will quake and glow a beautiful golden yellow each fall until new healthy pines return to share the forest.